Julio Francis Ribeiro (born 5 May 1929, in Mumbai (Bombay)) is a retired Indian police officer and civil servant. He held increasingly responsible positions during his career, and led the Punjab Policeduring part of the Punjab insurgencyperiods. 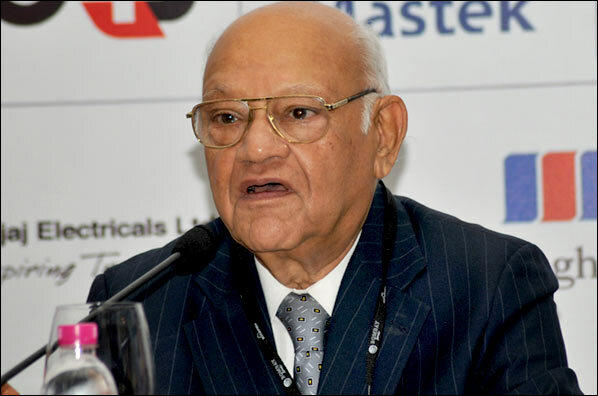 In 1987, he was awarded the Padma Bhushan, India’s third highest civilian award for his services. Since retirement, he has served on corporate boards of directors and performed social work. Did Mother Teresa want to convert those she found on the streets and took into her care? I doubt if those poor specimens of humanity were in any position to understand her version of god. I doubt if Mother Teresa could find an appropriate opportunity to preach Christianity to people who were starving, naked and in the throes of death. The RSS Chief Mohan Bhagwat can be hailed as the champion of Hindu culture and religion in our country. Mother Teresa, a Catholic Nun who left her native Albania as a young girl of eighteen and landed up in Kolkata to teach in a Catholic school, can be hailed as a champion of the Christian values of charity, love and compassion which are the fundamental doctrines of Christianity. Both Mohan Bhagwat and Mother Teresa are people to be admired for their respective commitments and devotion to worthy causes. So when Mohan Bhagwat proclaims that Mother Teresa’s prime motive behind her service to the destitute was not unselfish but motivated by the urge to convert poor Hindus to Christianity we need to pause and take notice. If his charge is proved Mother’s purported aim would devalue the virtue of a noble cause. My own friend and ex-colleague Prakash Singh of Police Reforms fame seconded Mohan Bhagwat’s assertion. He felt that there were many other organizations that had done better work than Mother Teresa but the media by highlighting only Mother Teresa’s work had wittingly or unwittingly encouraged Christianity! There is a grain, but only a grain, of truth in what Mohan Bhagwat and Prakash Singh averred. Mother Teresa joined the religious life as she believed in the teachings of Jesus Christ. There can be no doubt that she would have liked others to believe also. But all do-gooders are motivated by strong desires. There are thousands of them in India and some of them could well have done more useful work than Mother Teresa’s religious order. Baba Amte, another saint I knew, looked after lepers all his life. He was a Hindu. But I do not know of any one who has given up a more traditional existence as a teacher in a school to care for the dying and destitute beggars on the streets. Most people would just pass by such miserable specimens without batting an eyelid! A few would feel sorry and a few others throw a couple of coins in their direction but none would want to touch them for fear of the dirt and the disease. Mother Teresa did just that. Further she recruited a whole army of Christian Nuns who were put on the job of cleaning faeces and dirt that covered these human beings. Not an easy job by any means and certainly not one that I would like to do even if I was paid very handsomely. The RSS Chief and my ex-colleague are both men of principles. They, too, want to change the world in a manner of speaking. Mohan Bhagwat was certainly motivated by lofty ideal of service when he joined the RSS and rose to be its chief. The demand for a Hindu Rashtra was religious as much as it was nationalism. The degree is only a notch away from the religious motivation of Mother Teresa. Their approach to fulfillment was obviously different. Mother worked with her hands and her feet in the gutters of Kolkata. Mohan Bhagwat works from his office in Nagpur. Each was carrying out his or her life’s mission. Did Mother Teresa want to convert those she found on the streets and took into her care? I doubt if those poor specimens of humanity were in any position to understand her version of god. I doubt if Mother Teresa could find an appropriate opportunity to preach Christianity to people who were starving, naked and in the throes of death. Christianity would be the last thought in their minds and surely Mother Teresa had enough sense to know that. If Mohan Bhagwat takes a count of the b​e​ggers and the homeless rescued by Mother Teresa or her Sisters of Charity he may be shocked to find that none had time or patience to convert to Christianity. I am sure there must be records available of the disposal of their mortal remains after death. If they had converted they would have been buried. If they were Hindus they would have been cremated and entries to that effect would be found in the records of the Municipalities. He should have this checked. If Mother Teresa wanted to convert those she touched and if that was her main motive she would have continued as a teacher in a Catholic school and tried to influence impressionable minds. That would have been a much easier way of converting even good Hindus to Christianity. I doubt that, that was her motive and I say so because she chose the hard work that nobody else would want to do. As Ambassador to Romania I was concurrently accredited to Albania, the country of Mother Teresa’s origin. On one of my visits to Tirana, Albania’s capital city, my wife and I were lunching with Reis Malile, the Foreign Minister and his wife when a message was received that Mother Teresa was on her way to Romania from Rome and wanted me to accompany her. The Albanian Foreign Minister told me that they considered Mother to be their own and his government was very keen for her to open a centre of the Missionaries of Charity in Tirana. Their talks with her had bogged down because of Mother’s insistence on positioning a Catholic Priest in her proposed centre. This was not acceptable to the Albanian government as it was officially an Atheist State and did not allow the open practice of any religion. Reis Malile wanted me to explain to Mother that Albania had been predominantly Muslim before all religions were banned. If they allowed a Catholic Priest they would also have to allow Muslim Mullas and that would open the gates for myriad problems that they did not wish to face. When I mentioned this to Mother she was very clear that god could be worshipped by different people by different names and in different forms and she saw no merit in the Albanian government’s denial of the right to worship to Muslims, Christians or other faiths. After the Communists were replaced and religions worship was permitted in Albania Mother Teresa was approached by some young boys to cut the ribbon before their entry into a Mosque which the government had earlier converted into a museum but was now restored as a place of worship. Mother Teresa willingly went and cut the ribbon. When I asked her about it she said that god is one and if Muslims want to worship god it is a good thing that they were doing and they needed to be encouraged. I mention these two instances to clear Mohan Bhagwat’s misconception that Mother’s sole motivation was to convert those she touched to Christianity. I know that even the babies she cared for were given in adoption to parents who followed the religion of the biological parents of those babies and no attempt was made to convert. I have witnessed Mother nursing back to dignity hundreds of ‘abandoned as lost’ Christian children in Romania. Here there was no question of changing religions! As an Indian, I felt proud that an Indian order of nuns was doing humanitarian work in an European country. I have no doubt that Mother Teresa truly believed in the god of the Christians just as Mohan Bhagwat believes in the god of the Hindus. Personally I believe that the god they each believe in is the same. Only the name they each give to the one they worship is different. Both dedicated their entire lives to upholding the divinity of their god. If the missions and path they chose were different that is understandable. 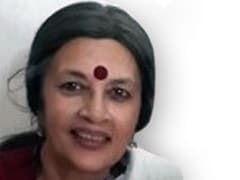 If some individuals got converted due to the awe and admiration that her work and her commitment evoked I do not think that Mohan Bhagwat or my friend Prakash Singh should or can object. If she has used force (?) or inducement (?) that would be immoral and truly condemnable. I have full confidence that she was incapable of using any form of violence or coercion. And finally, referring to my dear friend Prakash Singh’s peeve about the foreign press publicizing only Mother Teresa’s work I will point out to him that Kailash Satyarthi’s work with children was noticed and appreciated first in the western world. They had honored him abroad repeatedly, before he received the Nobel Prize. We in India had ignored his achievements for reasons that Mohan Bhagwat, Prakash Singh and Julio Ribeiro should attempt to fathom! 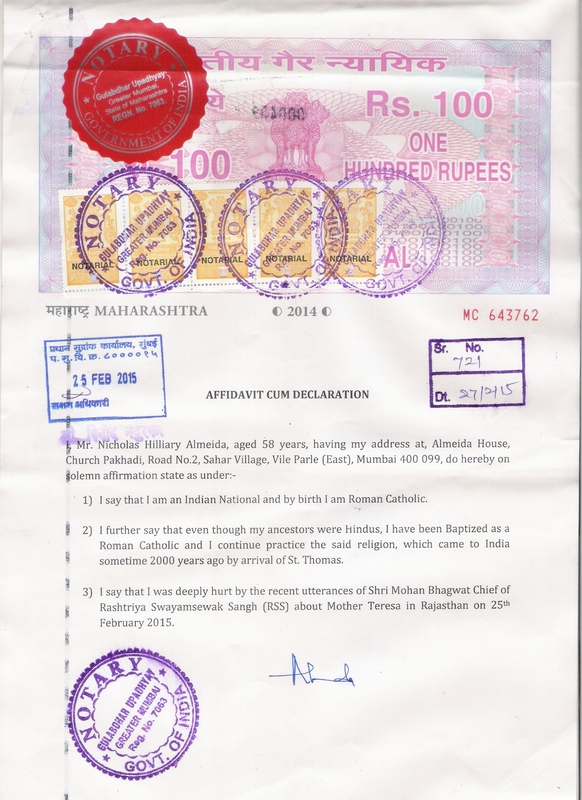 1) I say that I am an Indian National and by birth I am Roman Catholic. 2) I further say that even though my ancestors were Hindus, I have been Baptized as a Roman Catholic and I continue practice the said religion, which came to India sometime 2000 years ago by arrival of St. Thomas. 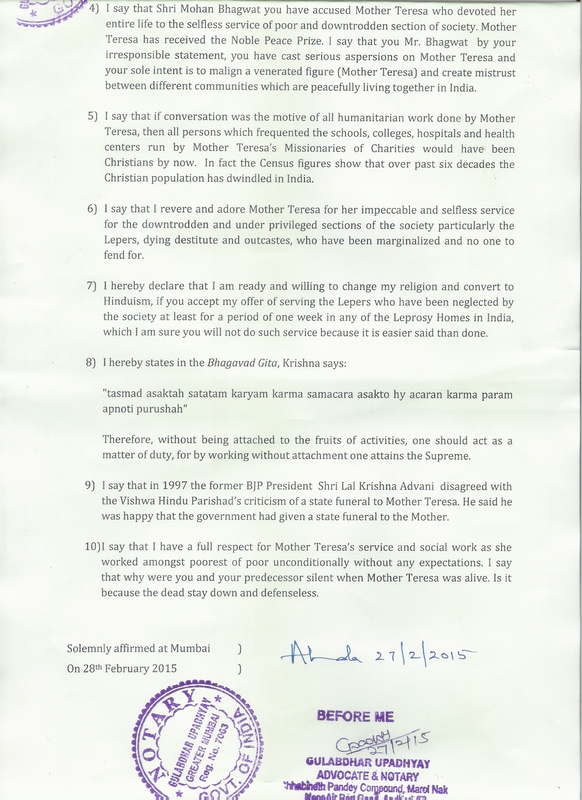 3) I say that I was deeply hurt by the recent utterances of Shri Mohan Bhagwat Chief of Rashtriya Swayamsewak Sangh (RSS) about Mother Teresa in Rajasthan on 25th February 2015. 4) I say that Shri Mohan Bhagwat you have accused Mother Teresa who devoted her entire life to the selfless service of poor and downtrodden section of society. Mother Teresa has received the Noble Peace Prize. I say that you Mr. Bhagwat by your irresponsible statement, you have cast serious aspersions on Mother Teresa and your sole intent is to malign a venerated figure (Mother Teresa) and create mistrust between different communities which are peacefully living together in India. 5) I say that if conversation was the motive of all humanitarian work done by Mother Teresa, then all persons which frequented the schools, colleges, hospitals and health centers run by Mother Teresa’s Missionaries of Charities would have been Christians by now. In fact the Census figures show that over past six decades the Christian population has dwindled in India. 6) I say that I revere and adore Mother Teresa for her impeccable and selfless service for the downtrodden and under privileged sections of the society particularly the Lepers, dying destitute and outcastes, who have been marginalized and no one to fend for. 7) I hereby declare that I am ready and willing to change my religion and convert to Hinduism, if you accept my offer of serving the Lepers who have been neglected by the society at least for a period of one week in any of the Leprosy Homes in India, which I am sure you will not do such service because it is easier said than done. 9) I say that in 1997 the former BJP President Shri Lal Krishna Advani disagreed with the Vishwa Hindu Parishad’s criticism of a state funeral to Mother Teresa. He said he was happy that the government had given a state funeral to the Mother. 10)I say that I have a full respect for Mother Teresa’s service and social work as she worked amongst poorest of poor unconditionally without any expectations. I say that why were you and your predecessor silent when Mother Teresa was alive. Is it because the dead stay down and defenseless. MohanBhagwat should practice what he preaches. Before making uncharitable charges against Mother Teresa for conversion-based-service, he should, as headoftheRashtriyaSwayamsewak Sangh or RSS,examine the framework his own organization works in,andconsiderwhether or not a fundamental course correction is in order if indeed its claim to socialserviceisto be credible.The RSS is selective in the areas of its so-called social service. It does no social service work where minority communities live. The schools it runs are wholly devoted to promoting cultures relatedtoHindutva. 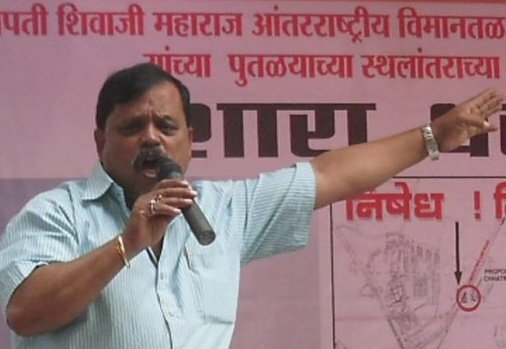 Its organization,theVanvasiKalyanParishad, working supposedly for “the uplift of tribal communities”, seeks to subordinate tribal cultures withintheHindutva fold by imposing the worship of Hindu gods and goddesses. It targets poverty-strickenChristiantribals for enforced conversionorGharwapasi, and in its absence creates divisions and hostility within the community based on religion.Even the term it uses – “Vanvasi”, that is forest people – is in opposition to the termadivasi, which recognizesadivasis as indigenous people of the land. Its welfare projects amongDalit communitiesis marked by caste arrogance exemplified by an earlier statement made byNarendraModi, trained as an RSSpracharak, when he glorified the degrading job of manual scavengers as being a spiritual service. Its defence of the caste system has now reached the absurd level of blaming ” Mughal rule” for its creation. You will rarely if ever find RSS volunteers working indalitbastis where they have been victims of caste-based violence. In case after case wheredalit houseshave been burned, and hundreds ofdalits rendered homeless, it is not the khaki shorts-clad volunteers whoare seen, but progressive organizations working alongsidedalit organizations and expressing solidarity through various means.As illustrated in numerous official reports, the RSS has been held responsible for a large number of the communal conflagrations that have taken place in India since independence. It first creates the violence, and then selectively works among one section of the victims. It made its name during the bloody aftermath of the partition, working in Hindu refugee camps. It continues that strategy. But not just in relation to Muslims. Citizens of Delhi who had mobilized in large numbers against the horrendous anti-Sikh violence in 1984 created networks which worked round the clock to offer solidarity and solace to the thousands who had become victims. The RSS wasconspicuous by its absence.Therefore when the Sangh attacks Mother Teresa, let them first turn the mirror on themselves. Their record shows one of communally -based discrimination in their very choice of who the beneficiaries of their service should be. This is not social service but work to further a sectarian political agenda. Mother Teresa started her work in Kolkata and in 1952 she set up the Nirmal Hridaya Home which took in destitutes, the abandoned, the sick and the dying off the streets of Kolkata. They were cleaned, fed and cared for. Many died within a few days of being rescued, but she and her band of dedicated volunteers made sure there was dignity in death. She ran a children’s home for those discarded by their parents because of a disability, left bundled on some street corner. Many of the children were then adopted. The couples who adopted them were not chosen for their religion. There was therefore no question of conversion of the children since the adopted parents could belong to any religion. She also set up a home for those afflicted by leprosy and trained them to be self-sufficient. There has been varied criticism of Mother Teresa and her work. Some of it is valid including the sources of her funding, her acceptance of support from dodgy international political figures, including those accused of high-level corruption, her opposition to women’s rights on the issue of abortion and so on. Charity-based work, as was Mother Teresa’s, is often patronizing and a salve for the conscience of the rich. She never questioned the reasons for poverty, and so some said that she glorified poverty and the sufferings of the poor unlike the liberation theologians of Latin America who worked to change their condition through social justice. But as Jyoti Basu, the legendary communist leader who was Chief Minister of Bengal in 1997 when Mother Teresa passed away, said “There was one thing in common between us, we both love the poor.” He paid homage to her work and her service to those who he said fell between the cracks of a sometimes uncaring city. She loved the poor, that is something beyond the RSS to understand, since it only knows how to convert love into hate. A Story goes thus. An ambitious person, who was very much in need of popularity; But since he was good for nothing, no one noticed him. By hook or crook he wanted to attract attention. He asked his friend, how he could be popular. ?How will people pay attention to him? Knowing his caliber, his friend advised him to go to a gathering where prominent people would be present and would be delivering intelligent speeches etc. while in the middle of the programme, do what donkey does. Honk like a donkey, and everyone will forget about what is happening on the dais and turn towards you. You will enjoy everyone’s attention. 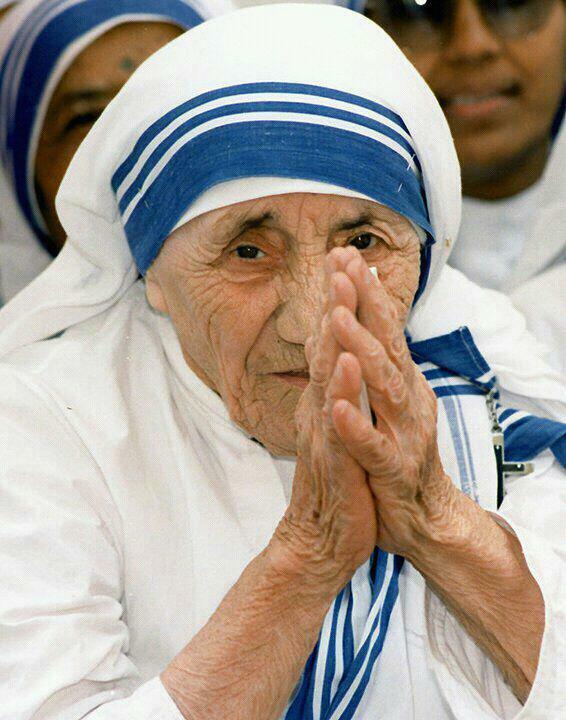 Bhagwat said Mother Teresa’s service to the poor was aimed at converting them to Christianity. RSS chief Mohan Bhagwat’s comments on Mother Teresa Monday evoked controversy but the organisation denied he had criticised the Nobel laureate who spent her life in the service of the destitute. Bhagwat, while addressing a function of a local NGO near Bharatpur, said Mother Teresa’s service to the poor was aimed at converting them to Christianity. “People like Mother Teresa did good work and service. But the aim was to convert the poor to Christianity. This kind of service is devalued if conversions are done in the name of service or work,” he said. Former chief minister Ashok Gehlot termed the statement “unfortunate”. “She left her country and spent her life to provide service to the poor. It is really a very unfortunate statement,” he said. Some Christian community leaders and NGOs in the state also flayed the statement. However, the RSS said the statement was mis-attributed. “Media reporting wrongly. At Bharatpur Ex DG BSF said that Mother Teresa did Seva with motive of conversion,” said a tweet on RSS’ official Twitter handle. “In reply Bhagavatji said, ‘let Mother Teresa know her motive for Seva, we do Seva without expecting any returns’ Dr M Vaidya,” said another tweet. BHARATPUR: Conversion to Christianity was the main objective behind Mother Teresa’s service to the poor, RSS chief Mohan Bhagwat said on Monday. “Mother Teresa’s service would have been good. But it used to have one objective, to convert the person, who was being served, into a Christian,” he said while speaking at a function organized by NGO Apna Ghar near here. “The question is not about conversion but if this (conversion) is done in the name of service, then that service gets devalued,” he said. “But here (at the NGO), the objective is purely service of poor and helpless people,” added Bhagwat. The RSS chief was addressing a function in village Bajhera, near 8km from here, where he inaugurated “mahila sadan” and “sishu bal grah” in the NGO for helpless women and childrn. In his Friday morning Mass, the Pope reflected on living the Christian faith coherently in public and private. He said that sometimes, Christians separate faith from justice. He set the example of a Christian who may donate money to the Church, but then pays his employees poorly. Pope Francis called on Christians to help those in needy, especially during Lent. “Pope Francis used his homily to reflect on how Christians, especially during Lent, should not confine themselves to outside signs of piety like fasting and charity and instead must reach out to those in need. He said Jesus wants from us a fasting that breaks the evil chains, frees those who are oppressed, clothes those who are naked and carries out justice. This, he explained, is a true fasting, a fasting which is not a just an outward appearance or observance but a fasting which comes from the heart. Pope Francis highlighted the example of somebody who goes to Mass every Sunday and receives communion but then asked: does that person pay his or her employees in cash under the table, maybe a salary below the going rate and without making the necessary social security contributions?